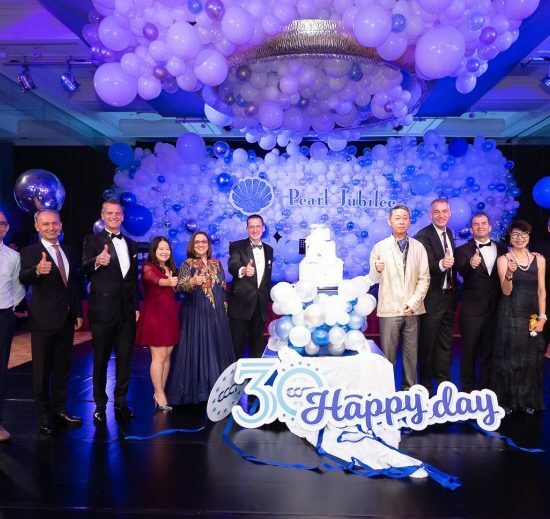 The European Chamber of Commerce Taiwan (ECCT) celebrated its 30th anniversary at a Pearl Jubilee Gala Ball Dinner held on 29 September at the Grand Hyatt Hotel. In his opening speech at the dinner, ECCT Chairman Håkan Cervell announced that, for the first time in its history, the number of ECCT members has surpassed 900 individuals. Today the ECCT is the principle nationwide business chamber in Taiwan promoting European business interests in Taiwan, representing 900 members from over 400 companies and organisations that have collectively invested US$45 billion in Taiwan, making Europeans the largest group of foreign investors in Taiwan. On 26 January 1988, 50 founding members of the chamber gathered at the Bankers’ Club on Minsheng East Road for the first annual general meeting, marking the formal launch of the chamber. By the end of the first year the first edition of Euroview Magazine had been printed, five committees had been set up and the first government visits and first Gala Ball had been arranged. The chamber’s first meeting with a sitting premier was in October 1990 and the first event attended by a sitting president was when President Lee Teng-hui attended the annual dinner on Europe Day in 1991. Since then the chamber’s government relations have grown from strength to strength. The ECCT presented its first position papers to the government in 1994. Every year since then the ECCT has annually published position papers that comprise issues identified by its committees as hindering the further development of their respective industries and provide recommendations to the government of Taiwan for improvement of the business environment on general issues as well as industry-specific problems. They also serve to keep the European Commission and parliament as well as the governments of individual European member states informed about Taiwan’s business environment. Today, the chamber has 30 industry and support committees, which have been successful in addressing specific concerns and providing concrete recommendations to all levels of government to facilitate improving the business environment. In 2008, the ECCT released a study conducted by Copenhagen Economics on the impact that an EU-Taiwan Trade Enhancement Measures (TEM) agreement would have for both Taiwan and the EU. A follow up study on the subject was released in 2012. Since the release of the first study the ECCT has consistently advocated a trade enhancement or similar agreement between the EU and Taiwan, including a Bilateral Investment Agreement. In 2012 the ECCT’s Low Carbon Initiative (LCI) was launched to showcase and promote low carbon solutions in Taiwan. Through the LCI the ECCT has earned a reputation as a champion of low carbon development. In 2013 the ECCT became a nationwide association. Since then the chamber has expanded its reach and activities to the whole of Taiwan, holding official dialogue with local municipal governments all around Taiwan on behalf of its members and hosting activities across Taiwan. To augment the chamber’s expansion of activities nationwide, the chamber set up two regional committees. The Central Taiwan committee was established up in 2013 in Taichung and the Southern Taiwan committee was set up in 2015, based in Kaohsiung. 2017 was an important year for the burgeoning wind energy industry in Taiwan. The chamber set up the Wind Energy committee and hosted a number of events to promote wind energy development during the year. Momentum in the wind energy continued in 2018 with the organisation of several events including a Wind Energy Summit in Taichung on 15 March.